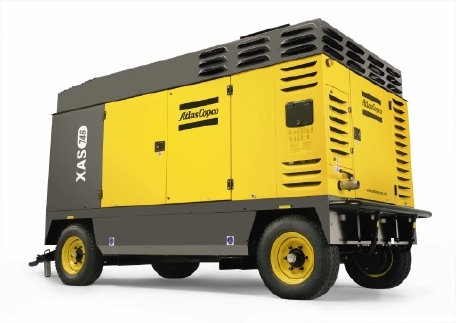 Atlas Copco’s Size 2 portable compressors meet your needs for high volume air at medium pressure. Booster manufacturers find them invaluable as source air compressors and they have become indispensable machines for rental companies. Powered by reliable Caterpillar diesel engines, Size 2 compressors are suitable for all your demanding applications such as heavy-duty drilling, quarrying, shallow water well drilling, deep-hole drilling and large diameter pipeline cleaning. All models are available in versions that meet the latest exhaust emission and noise directive criteria. Save on transport and stocking costs thanks to minimum footprint. Best fuel consumption in class. Low Total Cost of Ownership – You can achieve even lower fuel consumption with the addition of the innovative FuelXpert™ system, which electronically regulates engine speed and the air inlet valve to optimize fuel consumption. Safe for your operators – Safety features include pressure displays, emergency stop and spillage-free frame. Highly versatile – Ideal for use in all weather conditions and in temperatures between -25°C/-13°F and +50°C/+122°F. With certain models you can adjust the working pressure between 7-10.3 bar (100-150 psig) to suit your specific application. Special versions for working at higher altitudes are also available. Outstanding durability – Components last longer thanks to Oiltronix™, the electronically controlled oil temperature system, which extends the lifetime of air-ends, compressor components, oil and oil-separator. In addition, it prevents overheating and increases safety. High fuel autonomy – The high capacity fuel tank (up to 708 liters) allows Size 2 compressors to work in remote areas without the need to refuel.